Looking to fill up your iPhone or iPad with free apps? Great deals are constantly popping up in the App Store, and here are 69 iPhone and iPad apps that are now free. 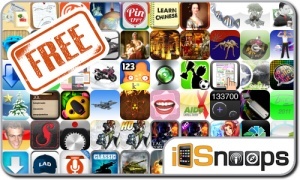 This apps gone free alert includes Dawn of Magic, Escape from Age of Monsters, Eagle Eye, Codename Cobra, Poker Pals, Doodle Movie Challenge, Big Win Soccer, TI Mobile, Vivid Wallpaper, and many others.